This is a great pillow that is made well. It is so cute and my girls love it. It is firm and very colorful. It matches the bedding so well. 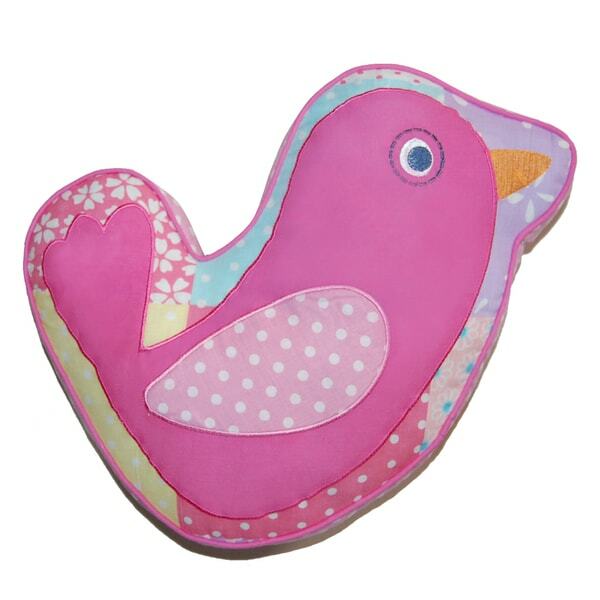 Add a fun touch to your bedroom decor with the Pink Bird Decorative Pillow. With its unique shape and fun look, your little one will want to take this pillow with them everywhere they go. I purchased this bird pillow for my great grandaughter’s bedroom. Much cuter in person, if that’s possible! Very happy with it! It works well with the Cozy Line Pink Owl set. Very pretty high quality bird pillow purchased to go with matching twin sized quilt. Looks absolutely beautiful in my granddaughters room! Just a fun pillow, my granddaughter loves it. This is probably my daughter's favorite pillow. It looks adorable in her room which has the my baby sam aqua bedding. we have birdie stickers all around and this just completes the look! It washes very nice as well! Cute pillow until you wash it. After one wash it has little pills everywhere. Wouldn't by again. Beautiful pillow!! Colors are excellent and quality is amazing!! 100% happy with purchase. Perfect accessory for my granddaughter ‘s room. It went with the pink owl comforter perfectly!! It is well made and the colors went perfectly. This pillow is large and well-made. Very cute and a good buy! Definitely a recommended purchase with the matching comforter. Super cute accent pillow to match my daughter's quilt set! Good quality and matches set perfectly. It matches a quilt set I purchased for my daughter.